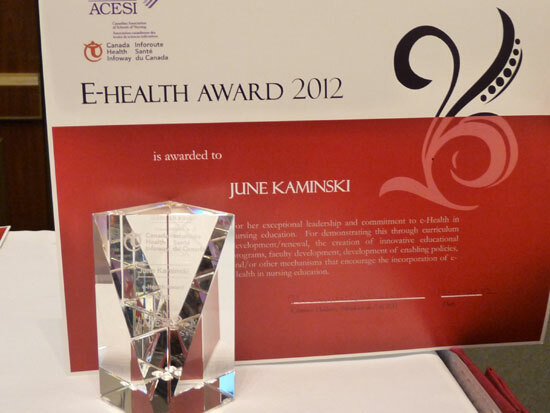 Congratulations to EDCP PhD Candidate June Kaminski, recipient of the Canadian Association of Schools of Nursing’s (CASN) prestigious E-Health Award! June is an Instructor in Kwantlen Polytechnic University’s Faculty of Community and Health Studies. She has been an established national leader in e-health and nursing informatics throughout her career and this award recognizes her long-standing and ground-breaking achievements. She is completing research on e-health and informatics, and the challenge of innovation in nurse education. June works under the Supervision of Dr. Stephen Petrina within Technology Studies. Kwantlen Polytechnic University (KPU) nursing faculty member, June Kaminski, has been chosen as the recipient of the Nursing Faculty e-Health Award. This prestigious award was presented during the Canadian Association of Schools of Nursing’s (CASN) Annual Award’s reception in Ottawa on November 13, 2012. The recipient of this award is a faculty member from a Canadian school of nursing who demonstrates exceptional leadership and commitment to e-health in nursing education. Aside from national recognition, Kaminski also received a $2000 award for her dedication to effectively integrating the use of information and communication technologies, information and knowledge management, and related professional and regulatory accountability into pedagogical materials. The 2012 Nursing Faculty e-Health Award is a component of the CASN-Canada Health Infoway – Nurses in Training project aimed at preparing nursing students to practice in modern, technology-enabled clinical environments when they graduate. KPU’s community and health studies programs are grounded in the concepts of caring, collaboration, inclusion and development of healthier communities. Programs vary in length from four year bachelor degrees to five month citations. For more information on KPU’s community and health studies programs visit kwantlen.ca/health. The West Kootenay Women’s Association Digital History Project, under direction of Marcia Braundy, has just made available a treasure trove for BC woman’s history and feminisms. The timelined site provides easy navigation and documentation for students, teachers, or researchers interested in localizing history through the everyday records of women and pro-feminist activists in the Kootenays. 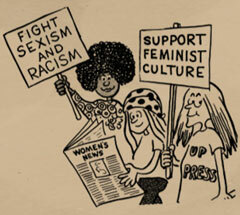 Students of history are given a rare glimpse of the types of records that it took to sustain a feminist movement and culture, and scale up activism to change across the province and country. Records such as the West Kootenay Women’s Association newsletters and images are priceless! Well done Marcia and thank you!! !